Hey everyone! 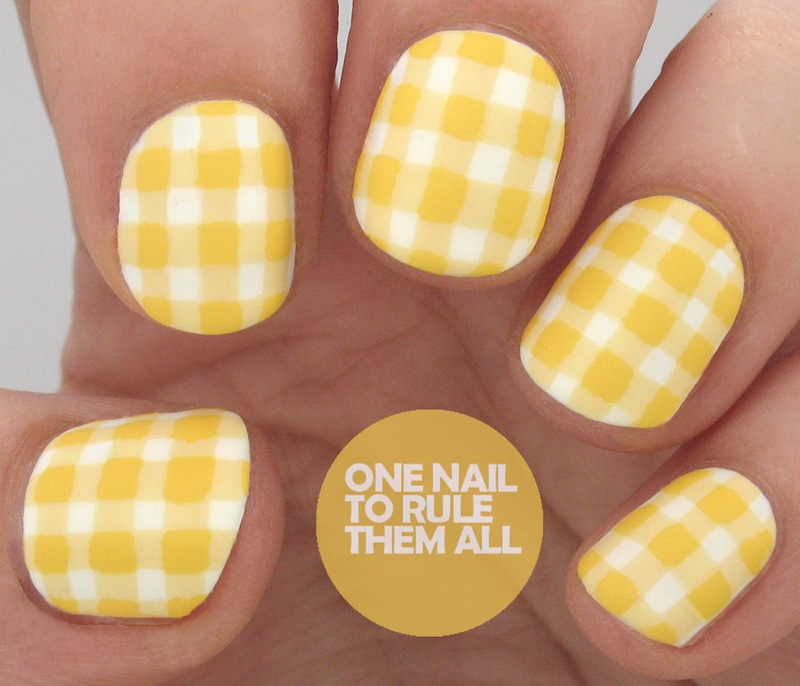 I've been meaning to do gingham nails for ages, they've been at the top of my to-do list for over a year, but I just haven't plucked up the guts to do them. Anything involving line work puts me off, I don't feel confident doing lines, and they often go awfully as a result, and as gingham is just lines, I've always been a bit wary of doing it incase I mess it up. 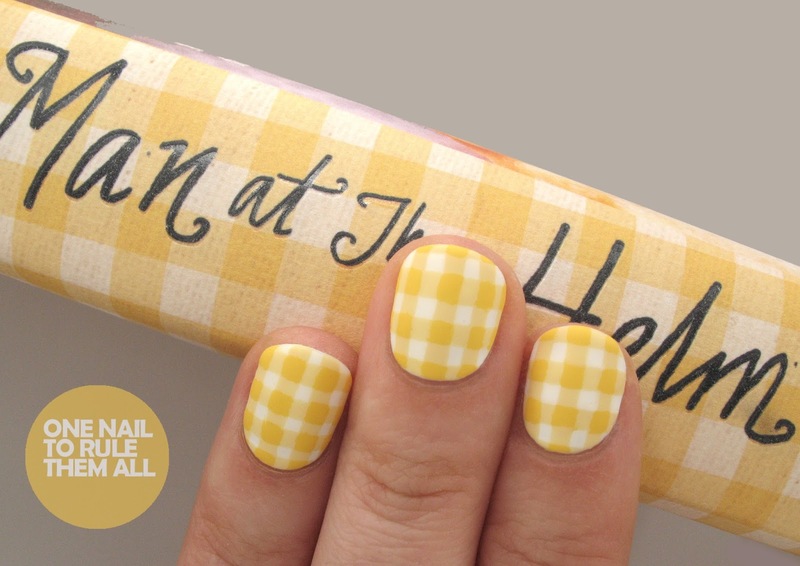 So when Penguin got in contact a couple of weeks ago and asked me to do some gingham nails inspired by the cover of their new release, Man at the Helm* by Nina Stibbe, it was the push I needed to finally do the design. I'm a huge fan of books, up until uni (which destroyed my free time) I never really had my head out of a book, now I only tend to read on trains, and ever since I got my car that's become a lot less regular as well. However, this summer I've really rediscovered my love of books. I've always been a staunch hater of e-readers but I got one a few months ago to save me lugging books around betwen uni and home, or on holiday, and I took it on holiday with me and read 4 books in a week, so they're pretty handy in a way, but I'm still a staunch supporter of having a book in hand. Especially when the cover is as lovely as Man at the Helm's. Which of course you wouldn't get to see if you were just reading it on Kindle. I've also done a few designs based from the cover of books before, and I've done a design of Penguin's own book covers, so it was an honour to be contacted by them. Man at the Helm* is a super quirky book, there's no other word to describe it. As you can see from the tiny glimpse of the blurb below (which my hand is mainly covering so you can read it properly on Amazon here), it's written in a fun and realistic style, and I like that a lot. I read 100 pages without putting the book down, and I really really love what I've read so far. The book is released today, and you can get it for Kindle for £5.03 on Amazon here, or in hardback for £9.09 (RRP 12.99) here. 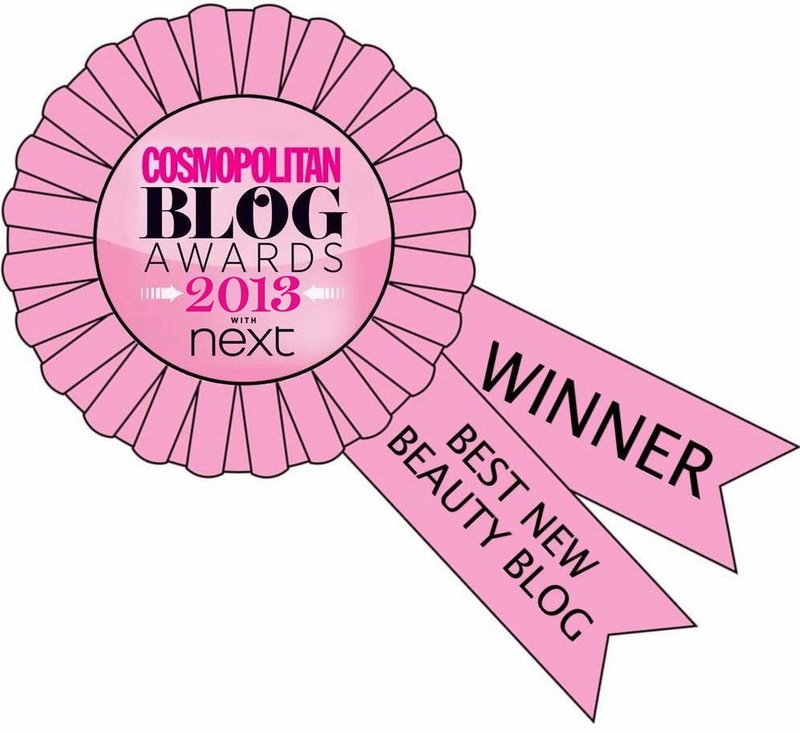 And, of course, the cover is gorgeous, so it will look lovely on your shelf once you've read it too! 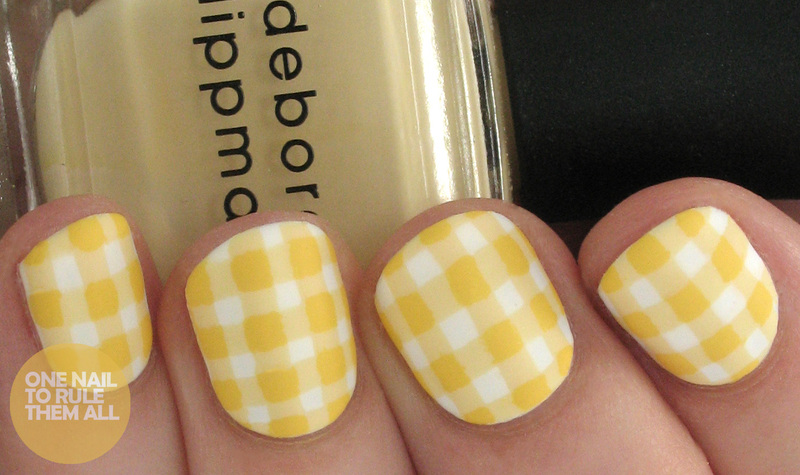 The base for these nails was MASH - White, and then I used Deborah Lippmann - Build Me Up Buttercup with a striping brush, and then I filled in the middle squares with Deborah Lippmann - Walking on Sunshine, finished off with Butter London - Matte Topcoat. If you like the look of the book you can buy it here. Just beautiful-such a effective yellow design. Oh yeah! That's a great inspiration and you totally nailed it :D How can you draw such perfect lines?! 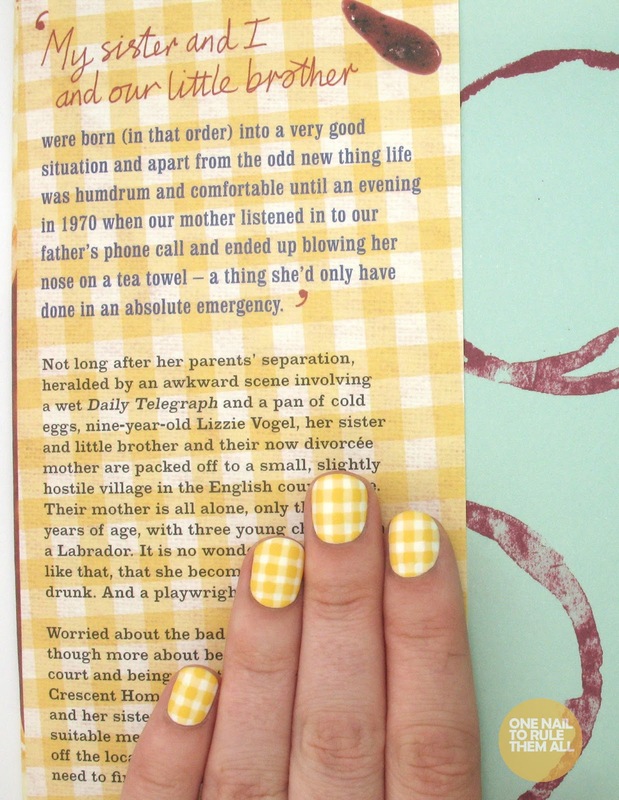 Tracey Beaker Nail Art - Bog Off!